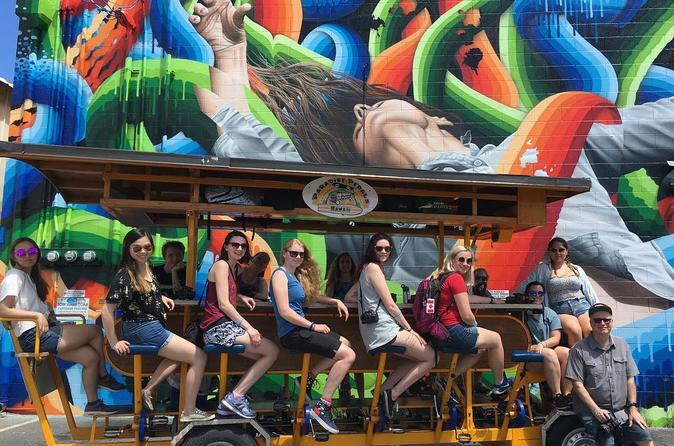 Pedal your way through Kaka'ako, Honolulu's arts and warehouse district on Hawaii's only 15 passenger bike! Grab your camera as your guide steers you and your new friends to see some of the popular POW! WOW! murals. POW!WOW! is an art festival expanding in cities and countries across the globe with the main event taking place in Honolulu every February. Enjoy a smoothie or acai bowl from a local fave, Lanikai Juice on this 2 hour adventure with optional hotel pickup and drop off (Select Waikiki Hotels). Calling all art lovers and creative minds alike. Hop on board this exciting and truly special experience that will stimulate both the body and soul. As William Shatner once said, “Energy is the key to creativity. Energy is the key to life.” So, get your cardio pumping whilst you get your creativity flowing on this dynamic journey through the popular POW! WOW! murals. POW! WOW! is an art festival expanding to cities and countries across the globe with the main attraction featured right here in Honolulu every February upon which new murals emerge in their full and exceptional glory. According to the New York Times, these murals truly capture the “strong color[s], and the vividness of color shown in marine sunlight.” The ART tour also features a special area known as SALT which is a dynamic city block designed for exploration and engagement with the Kaka’ako community which is Honolulu’s renowned and world-famous arts and warehouse district. In SALT, riders can enjoy a refreshing acai bowl packed with flavor or a fresh all natural smoothie at a local favorite, Lanikai Juice! This tour also offers a hotel pickup and drop off option.